Strengthening our leadership position in labeling and detection, Enzo Life Sciences now offers EQ Quencher Dyes – amine-reactive quencher dyes that can be used for fluorescence resonance energy transfer (FRET) applications. EQ Quencher Dyes (EQ0, EQ1, and EQ2) are NHS ester quencher dyes that can be conjugated to amine-labeled probes. The EQ Quencher Dyes have a broad visible absorption but no detectable fluorescence emission, making it useful as an acceptor in FRET applications. The EQ Quencher Dyes can be used in molecular biology FRET applications to quench fluorophores. Together, the absorption ranges of the EQ Quencher Dyes (EQ0, EQ1, and EQ2) cover most commercially available fluorophores. Through combining different reporter-quencher dye pairs, probes can be multiplexed. 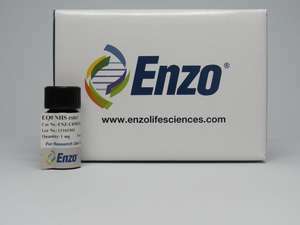 For more information, or to order the EQ Quencher Dyes or other Enzo Life Sciences products, please visit us at www.enzolifesciences.com or call us at 1-800-942-0430.